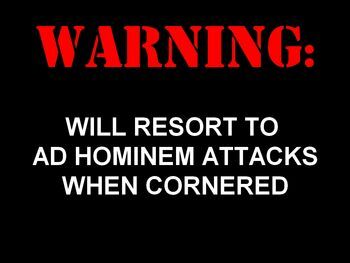 Ad hominem, meaning "to the man," is a fallacy that attacks the person/group delivering a claim, instead of attacking the claim itself. Many of the questions MormonThink contributors and editors have to do with our membership and beliefs in the Church of Jesus Christ of Latter-day Saints. Those trying to discredit the work of MormonThink, or those investigating the truth claims of the Church, often believe that if the message about the Church is delivered by unbelievers, disaffected, "antis" or anyone else who is less than devout and active, that the information they are sharing is untrue. That is an example of the ad hominem fallacy. Unfortunately, Church leadership often exacerbates the problem by using the ad hominem fallacy as a scare tactic to keep members from finding out information about the Church, especially its history. Something that is true but shows the Church in anything but a positive light is immediately deemed "anti-Mormon." This is a way to keep people from examining unflattering facts about the church. In reviewing many LDS responses against critics of the Church, many of the devout seem to focus an inordinate amount of time on the critic's motives or their personal lives. We have to ask why they aren't arguing the facts or interpretation of the facts instead of the motives of the critics. We've seen Simon Southerton, who published a book demonstrating how DNA disproves some claims of the Book of Mormon, attacked by the LDS faithful because he had marital problems. The LDS apologists spent the first part of their attack on Grant Palmer's book An Insider's View of Mormon Origins complaining about the title of the book because the publisher used the word 'Insider' which they object to. Non-LDS Egyptologist Robert Ritner was attacked for his lack of religious belief when he was asked to evaluate Joseph's translation of the Book of Abraham papyri, which he showed Joseph was in error. Michael Quinn, author of many very factual, but unflattering LDS history books, is attacked because he is gay. So what do any of those things have to do with their research on Church history? So often in Church we've observed that the first thing out of someone's mouth when discussing a critic's unfavorable research into the Church is 'he's an anti-Mormon' or 'he's gay' or 'he committed adultery' so any pre-conditioned LDS member will automatically reject any research done by the 'sinner' before they even look at their information. Why do some so often resort to personal attacks on anyone who seems to have evidence disproving the Church's claims? Why can't they just argue the facts? Our opinion is that anyone who attacks someone's personal life must have a weak response against the person's arguments. If you ask a mathematics professor to solve an equation, what possible difference does his motive, his religious beliefs, his marital fidelity or anything unrelated to mathematics make in evaluating whether or not he solved the equation correctly? The same is true with church history. Regarding our motives: Dozens of people have contributed and have been involved in the production of MormonThink. We don't always agree on everything and some of us may have different motives for helping develop this site. Some honestly like going to church and being a part of it - they just wish it was true, some still believe it to be mostly true, some have decided that the issues are just too troubling and no longer wish to be members and others stay in for family reasons. Some contributing members of MT are actually still believers but want inaccurate faith-promoting stories corrected and desire that only true history be taught. But the one thing we all have in common is an altruistic desire to share the truth if asked, as we understand it, with our fellow Latter-day Saint friends and neighbors. We only want people to know what we know and then they can do whatever they want with that information. How important are motives really in determining truth? What if LDS President Thomas Monson said that the world is flat and Osama Bin Laden said that the world is round, who would you believe? Something to think about: When Mark Hofmann brought the infamous Salamander letters to the First Presidency, the President of the Church declared them to be valid documents and purchased them for the Church at a high price. However the biggest "anti-Mormons" the Tanners, said that the documents were forgeries, even though the documents would make the Church look bad. If we were back then, who would you believe was right, the humble Prophet or the bitter, lying anti-Mormons? Well, the "anti-Mormons" were correct. The documents were proven to be a forgery after Mark Hofmann was arrested and convicted for killing a Mormon bishop and duping the Church into buying forged documents. Bottom Line: The facts speak for themselves, regardless of who says them and why. Don't shoot the messenger.